It's been a hard couple years for those of us who championed shows like Buffy the Vampire Slayer and Angel. While there have been shows of equal interest -- spyfest Alias, island genre-bender drama Lost, and high school noir Veronica Mars all come to mind -- there have been few interested in picking up the folkloric roots from which both shows sprang. Supernatural is probably the most successful to date, and it takes that seed of pure storytelling and runs with it in an altogether different direction. Brothers Sam and Dean Winchester (Jared Padalecki and Jensen Ackles) have been hunting monsters for nearly their entire lives. Their mother was murdered by a demonic entity when they were young, and their grief-stricken father took them on the road, discovering and killing evil in all of its forms. Now grown, the boys find themselves carrying on the mission alone when Dad disappears. There are a lot of scary things in America, but the Winchester boys are prepared... or so they think. Supernatural maintains a basic format for most of its 22 episodes. Sam and Dean arrive in a small town (and occasionally a larger city like Chicago) after reading something weird in the newspaper or the obituaries. Through a combination of con games and research, they gather the necessary intel on the local spook show -- usually tied into a classic urban legend (the Hook Man, Bloody Mary) or something much older (demons of all shapes, sizes, and ferocities). The classic solutions are often inadequate and the boys must improvise to save themselves and the weekly guest stars. Surprisingly, the format doesn't get stale. The writing team keep the pace varied and the tricks fairly new. Plus, there's a few ongoing plot threads that weave through the season that provides ample distraction from what could be a monster-of-the-week disaster like Smallville in its early seasons. Plus, just as in Buffy, knowledge is power. The better episodes provide not only thrills and chills, but also a glimpse into the unique nature of American myth. Bringing us into the action and maintaining our interest are the compelling Winchester brothers. 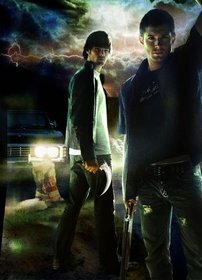 Where it would have been easy to fall prey to making one a weak nerd with all the answers and the other the dumb muscle with none, creator Eric Kripke and his writing staff instead choose to show us to boys who are on their surface very similar -- both capable demon hunters with brains behind the brawn. Dean, the eldest, is emotionally shut-off, hiding the fact that he is completely dependent on his family -- especially his brother -- for purpose. Sam is open and apparently better adjusted, but tragedy tends to slam him harder and discoveries throughout the season don't help. The balance between these two and the interplay that results is the candy for those who prefer more a character-driven series. One thing Kripke set out to do with Supernatural was to create an actual horror series -- one that was consistently scary from week to week. In this task, he succeeds quite well. The show maintains a genuinely creepy tone throughout, even with the (very few) episodes played for the lighter touch. We get at least one hard shock an episode. The look of the show is muted and drained -- there's no bright sunshiney day for the Winchesters, and this adds to the milieu of fear that builds in each episode. Unfortunately, that very thing also creates a significant flaw -- the more familiar we become with the Winchesters and their world, the more the show must struggle to provide us with a believable antagonist. The series finale does this well, but one gets the feeling that once all the interesting monsters are used up, the show might not have that much farther to run. It has another season in it, certainly, but beyond that it's hard to say. Additionally, the writers have difficulty creating characters outside of the Winchester clan who pop off the screen in interesting ways. The weekly guest stars are just that -- guest stars. They are ultimately disposable and that makes it difficult to get excited over individual episodes. Still, some people might see that as a benefit. Overall, Supernatural is what its title suggests -- a good yarn about monsters and ghouls. It's spooky, gets under your skin, and is frequently well-told. Whatever flaws exist are as set into the show's format as most of its virtues. If you can overlook those drawbacks, you might find an exciting, fun show that's good for a few jolts, with engaging main characters as an added bonus. Submitted by Anonymous (not verified) on Fri, 2014-05-09 22:31. Disagree with you regarding the "guests." This is one of the strong [points of the show. These characters are not the one dimensional beings that exist on today's tv but are compelling.